Ensuring software quality is a challenging task in the current dynamics with aggressive timelines, changing business requirements, increasing enterprise-level constraints and demanding user experience expectations. These challenges make the development team's task more demanding and often there is a dilemma on how to balance between software cost (more time for ensuring quality) vs. software quality. In this blog, I am sharing my thoughts based on my experience & research on this subject area. How do we define Software Quality? In this blog, focus is on improving the structural quality of software, which eventually impacts functional quality aspects as well. How do we define Structural Quality? "the degree to which non-functional attributes of a software product such as maintainability, modularity, robustness, etc. satisfy stated & implied needs for the software product"
Some structural quality attributes such as performance & security can be measured using static/dynamic code-metrics tool, whereas few attributes like modularity & maintainability might require manual review process. What are the focus areas to ensure Software Quality? 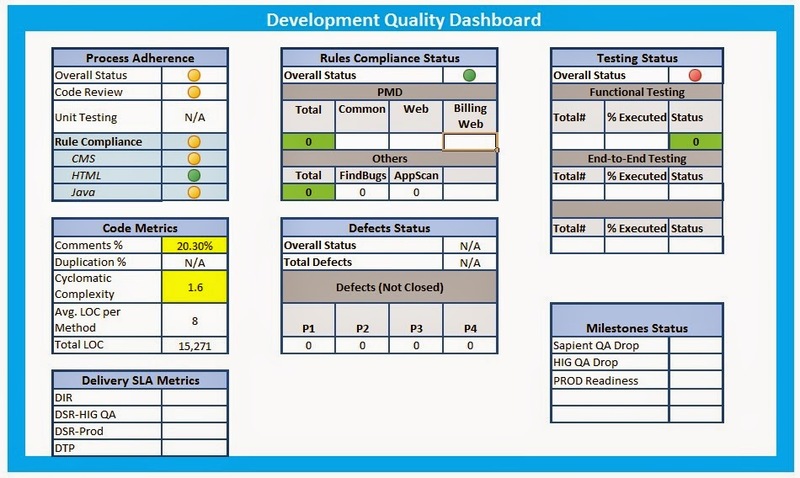 What are the metrics & tools to measure Software Quality? How do we provide governance to keep check on Software Quality? Governance needs to be very simple & effective. A very complicated structure & complicated process does not go well with team and often people tend to deviate from it. A periodic checkpoint with team as part of governance model is must and needs to be informal to assess actual health of the software system. Do we have any future vision (as-is & to-be map)? Moving from Subjective Development Quality towards Measurable Development Quality is very important. If we don't know how to measure quality, then it can't be measured against any internal/external benchmark. Quality Governance Model is often ignore and not well established or not followed. Having Architecture Review Board, Design Review Board & Quality Review Board (on periodic basis) is a big plus and needs to be supported by Senior Leadership. Automation is the key to meet aggressive timelines challenge & usually it is less prone to errors. Whether it is code generation, build generation or quality reports automation, it holds key to success. Having Uniform & Consistent Methods to apply during SDLC phases ensures success with certitude. Finally, establish benchmarks in your organization to compare quality score of each project. Without knowing where you stand, it's impossible to achieve the targeted goal. What's the rules to evaluate the Qualitu characteristics ?